This series provides advanced exercises in visual perception ability,general learning and higher thinking skills, and spatial relationship. There are over 1000 advanced brain-challenging exercises in these 8 workbooks. The same miniLUK Controller is used in a more advanced operating model involving higher level of eye-hand coordination. 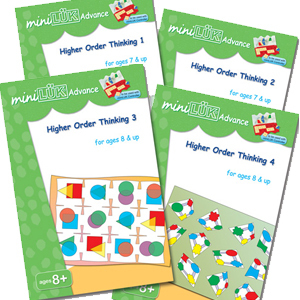 These four workbooks are specially designed to develop important brain functions and facilitate children's overall learning abilities and higher thinking skills. Effective learning involves many different skills and abilities. Memory, concentration, visual perception, reasoning, and logical thinking are all critical to establish a solid foundation for effective learning. The activities in these workbooks have been carefully designed so that the skills learned progress at a rate of increasing difficulty. Through the constant repetition of practicing, the brain is relieved from the basic information processing and leaves rooms for more complex tasks. Exercises presented in these workbooks are well structured from basic to more advanced and challenging, and cover all the important skills in which to build the foundation for effective learning and higher thinking abilities for young children.